I have quite literally never experienced a stench like the one I am currently smelling in Toronto. The garbage men are on strike and this city smells awful!!!!! I literally almost vomit when I head to work each day. It is awful. I am worried that our city which is normally so beautiful and pristine will end up buried in a pile of rotting garbage. I feel like every day when I go home I have to wash the stink off of me. 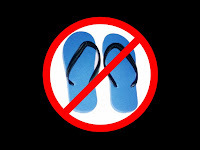 It makes me sad that the bottoms of my shoes have to touch the pavement.....Flip flops are not an option this summer!! !